Since the Landesgartenschau (Regional Garden Show) in 2005, Leverkusen has had a contemporary park which passes over roads to link the city centre with the river panorama of the Rhine. The aim of the Garden Show was to transform an old dump into a flowering landscape. Experts are impressed by the award-winning result in terms of both urban development and environmental policy. Today, the Neuland-Park is a green area of retreat in this industrial sector of the town. Eight terraced levels in the shape of a “boomerang” were created on the landfill, which is located in front of the neighbouring Bayer factory. The dump continued to be filled until the 1960s and great care was taken to ensure that it was safe. The terraced levels feature colourful flowerbeds, themed gardens, generous areas of grass for picnics and numerous children’s playgrounds. The new Rhine promenade was linked to the rest of the area by futuristic footbridges. The landscape architects and planners had no intention of allowing the past of the terrain to be forgotten. The strictly architectonic elements of the park are evidence of the “artificiality” of the park landscape. These elements form a stark contrast to the renaturalised river landscape of the Dhünn, a small river which was freed from its concrete bed as part of the Regional Garden Show. The citizens of Leverkusen were involved in the project at an early stage as the aim was to design the park in such a way that they could “make peace with the area”. The “Bürgerallee” (“Citizens’ Avenue”) with 120 ash trees and sweet gum trees donated by citizens of Leverkusen is a living sign of this. Leverkusen’s Neuland-Park is a contemporary green space which now links the city centre with the river panorama of the Rhine again after a long interruption. The park on the terrain of the 2005 Landesgartenschau (Regional Garden Show) is situated between the contrasting scenes formed by the backdrop of the neighbouring Bayer factory to the south and an almost rural river landscape to the north. It is now a further green area of retreat for the town. Rüdiger Brosk, landscape architect from Essen and Agirbas & Wienstroer, achitects and planners from Neuss, emphasised the artificiality of the park landscape by using strictly architectonic elements, contrasting these with the classical Rheinpark and its large areas of grass. The park architecture forms a stark contrast to the renaturalised landscape of the Dhünn, a small river which was freed from its concrete bed as part of the Landesgartenschau. A 550,000 m3 landfill which had been in use right up to the 1960s stood on the spot where eight terraced and planted areas in the shape of a “boomerang” now give the park its name. Following the demolition of a residential development which had been built on the land after the dump was closed, an elaborate process was carried out to make the polluted area safe. A permanent exhibition on the site documents this story. With its award-winning result, the town not only managed to transform an old dump into a flowering landscape without forgetting the past, but also succeeded in impressing experts in terms of both urban development and environmental policy. Today the “boomerang” terraces, themed gardens – e.g. the “feng shui” garden and the water features at the “Nobelstraße” entrance – invite visitors to linger. Large areas of grass, shrubs, colourful flowerbeds and numerous playgrounds for children offer quiet moments of rest in the midst of this pulsating town and its industrial history. The futuristic “Neulandbrücke” connects the Neuland-Park with the Rhine promenade – likewise newly designed. 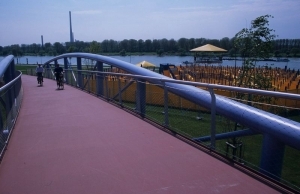 This promenade in turn forms a continuous link along the river to the Wiesdorf and Bürrig areas of Leverkusen, stretching as far as the marina at Hitdorf. Visitors on the path from Wiesdorf to Rheindorf pass by the point where the Wupper enters the Rhine. Three ships for eel fishing – “Einigkeit”, “Recht” and “Freiheit” – were moored here as a boat jetty until 1992. An active and energetic citizens’ interest group has set itself the aim of bringing the ships back to the mouth of the Wupper after they have been restored and repaired. This commitment and further voluntary work for the Regional Garden Show and the area directly around it are a clear illustration of the significance of the park for the town and its population. 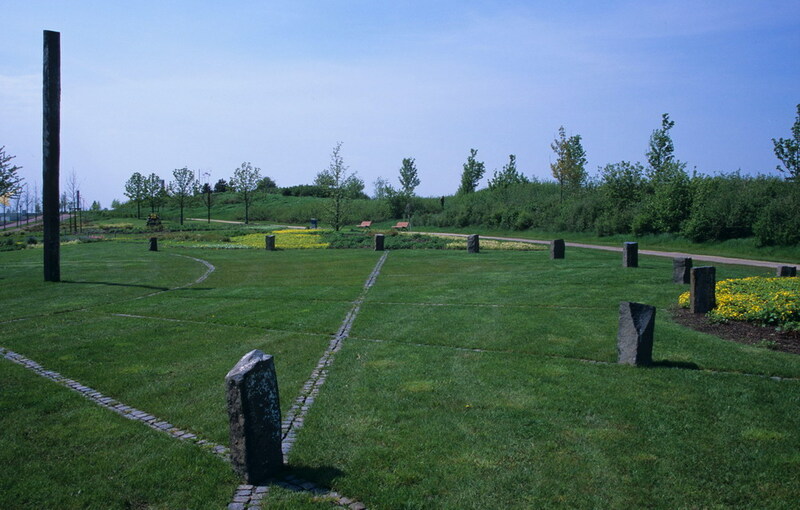 The citizens of Leverkusen were involved in the project at an early stage as the aim was to design the park in such a way that they could “make peace with the area”. The “Bürgerallee” (Citizens’ Avenue) with 120 donated ash trees and sweet gum trees is a living sign of this. Winter (from 16.10. to 31.03.) from 6 a.m. until 6 p.m.
Summer (from 1.4. to 15.10.) from 6 a.m. until 10 p.m. Dogs are not permitted in the park.